This dealer is unavailable until Apr 19, 2019. 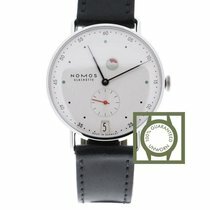 This Nomos Metro Gangreserve Datum 1101 Leather Bracelet (wrist size: inches) Stainless Steel Bezel (case size: 37.00 mm) White Dial men watch is in Excellent condition. The watch has a(n) Manual movement. The crystal is Sapphire. Additional Notes: This timepiece is in overall excellent pre-owned condition. All photos are of the actual watch being sold. Powered by Nomos' in-house caliber DUW 4401 hand-winding mechanical movement. Power reserve indicator in mint green and red is located beneath the 12 o'clock position. Most importantly, this watch is located at our facility, is Crown & Caliber Certified Authentic, has undergone any necessary service, and comes backed by our 1-year warranty. Prior to shipment, the watch will undergo a final quality control check to ensure it is functioning as intended.